Seven-time Grand Slam champion Mats Wilander is one of the earliest adopters of Donnay solid-core racquet. For the past seven years the Swedish hall-of-fame has played with the X-Red, 94, one of the original Donnay X-Series models with no formal commercial endorsement relationship with the brand,in exhibitions and on his grass-roots “Wilander on Wheels” fantasy camp tour. Q. Why did you pick the X-Red? I like the look of it which is very important to me and i like the way it feels to hit a ball with it because it’s solid and flexible. It has feel but it’s solid. i don’t like stiff racquets because I have a lot of racquet-head speed. Q. Why did you choose the smaller 94-square-inch version of the X-Red instead of the bigger 99? 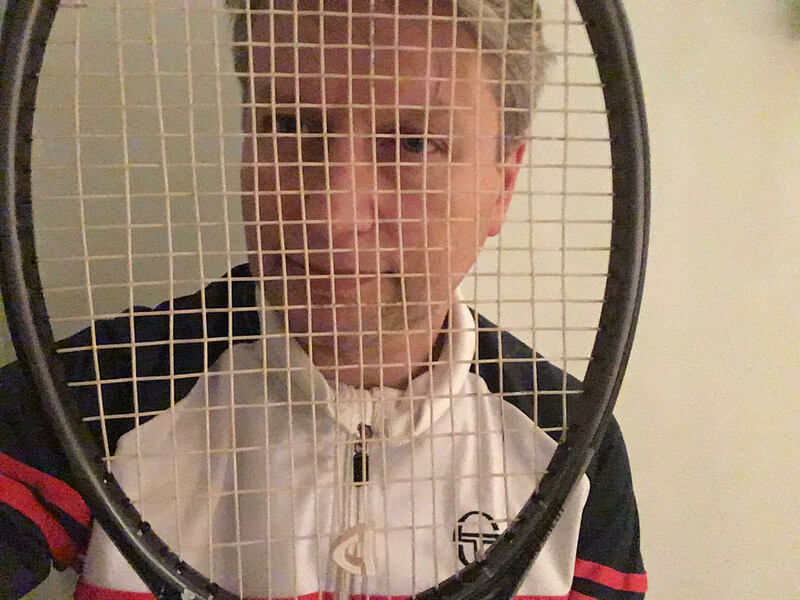 A. I’ve never liked bigger-head racquets because I miss the middle [sweet spot] when the racquet face is too big. Q. You mentioned you once had a shoulder problem. Does it still bother you? Never with the Donnay, no matter what strings I use, even [harsh] polyester. I often put polyester in the cross strings and gut in the main strings which takes some of the harshness away, and I think it gives me more spin with the gut in the mains. The ball seems to just slide across the face. Q. Do you break a lot of string using gut? Actually it’s amazing how long gut lasts in a hybrid [set up]. Q. You’re on the road a lot with the Wilander on Wheels tour. What keeps you going? Q. At the age of 53, how long do you think you’ll keep touring? A. (Laughing) Not until they [Wilander on Wheels fans] stop calling. My tennis elbow was so painful 20 years ago that I had to quit playing for a year. I started doing a lot of research on tennis forums looking for answers and what might have caused it, I think it was playing with a very head-heavy Wilson Hammer 6.4 Power Holes Oversize 110. I did a lot of the exercises that people suggested on the Tennis Warehouse Forum and went to a chiropractor three times week that seemed to be a big help. When I entered tennis again I bought a ProKennex KI 20 and a tennis elbow arm band, without too much trouble, that is until my arm began to show stress fractures. So I started researching the Donnay tennis racquets (I’m a big fan of Andre Agassi and Jim Courier who played with Donnay), and now own three of them, including my favorite, the Pro One 102. Thanks so much for making arm-safe racquets. We need a company like yours that is concerned about players’ health. Like almost all players, I've demoed and picked up a good number of racquets in search of the best one to fit my game. The Donnay Pro One Mid-Plus fit the bill better than any other I've tried. Despite its oversized and forgiving 102-inch head size, it’s an intermediate to advanced frame that is right in my wheel-house. It packs some nice power and seems well balanced in the control-versus-power departments. You really get the best of both worlds here. Coming in at around 11 ounces (strung), it is also in that “customizable" sweet spot where you can add some lead to bump up the swing weight, or get a little more weight in the handle to make it more maneuverable. I found the combination of a bit of lead at the 3 an d 9 o’clock positions, as well as a leather grip to fit the bill nicely. But perhaps my favorite thing about this stick is its comfort level. It's incredibly comfortable to hit with, but not mushy at all. I've played some racquets with a lower stiffness ratings that are comfortable, but also mushy with a lack of feel. This provides all the comfort I want without sacrificing touch and feel. My only complaint about this stick are the aesthetics. It's not a bad looking racquet, but its not the best look in the world either. Donnay's more recent frames seem much more eye friendly. This particular model is also a bit prone to chipping. I actually applied a coat of clear polish to the outside of the frame to offer some protection from that, and it's been working nicely. I am a 3.5-4.0 level, all court singles player who plays at least weekly. I gave this Donnay a try, because the “big name” racquets I was demoing at retail level did not impress, and given the history and notoriety of Donnay, I wanted to give them a shot. I also previously used a stiff Yonex frame that bothered my arm, and I liked the dual-core feature and lower RA (stiffness) rating of the Pro One Mid-Plus. All things considered, this is a solid offering from Donnay that is a very well rounded racquet offering comfort, control and solid power. It's definitely worth a shot at the right price point. I started playing tennis in 2014 just to keep fit but my passion for this sport grew and today it occupies an important part of my life. I noticed most of my tennis partners were suffering or recovering from tennis elbow and I researched the reasons for this type of injury to protect myself. Because of my background, I knew that the main cause was the repetitive vibration produced by the shock of the ball on the racquet face that was transmitted to the arm, along with poor technique. 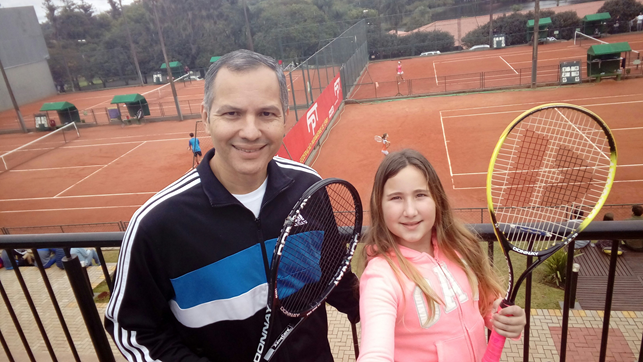 At first, I started using a Head racquet, but I was never able to hit the ball with power because I was afraid of injury, so I could not make progress. Soon, it was clear to me that it would be difficult, if not impossible, to improve my performance if I could not find a racquet that allowed me to hit the ball with full power and without hesitation. In the process of searching for the ideal racquet, I researched many famous brands and tested dozens of rackets. None of them gave me any security, as I knew my tennis buddies were using them every day. Then I suffered a right elbow injury when I was using a light Head racquet that was not diagnosed as tennis elbow, but it hurt a lot when I played. I was absolutely frustrated. I went to the Internet to research Donnay (we are familiar with the brand in Brazil becasuse of Bjorn Borg) and found what I was looking for. The perfect racquet -- the Pro One 97 (18x20). Today, with the Donnay my game has evolved a lot. I am hitting the ball with extreme power, from both sides, without any hesitation and with absolute conviction that I will not be injured again. This is the best result a racquet can deliver. Certainly without my Donnay, I would not have that same confidence. That was the beginning of my history with Donnay. Currently, everyone in my family uses Donnay because it is the only[brand] I allow to enter my home. Please, feel free to use or not this information in the “My Donnay Story” section. My intention is just to express my gratitude for those who designed this incredible racquet. Meet Lambros who was smitten by the comfort and beauty of the Donnay frames and now has one of the largest collections in Europe. I probably have one of the largest original Donnay collections in Europe -- more than 30 frames, like the Pro One 18x20 and the unique X-Dark Red that are exceptional but highly underrated sticks. The sheer quality of the Xenecore racquets and the emotional power of the old Bjorn Borg wooden frames have made me a Donnay addict. The fact is that I have become addicted to them because of their unique comfort and beauty. Having played in the past with mainly Babolat racquets such as the impressive Babolat Pure Drive and Pure Strike 97 sticks, I find that Donnay Xenecores are one level ahead. With the Babolats I would always notice that my arm would start giving me pain once I would string with poly at tensions above 23-24 kg. On the contrary, the Donnay Dual Pro One 18x20 and the X-red 99 would never give me any issue even when strung at 25 kg with Hurricane Pro. The Donnay Formula is also an exceptionally comfortable racquet, although not my preferred one despite having four of them. The Dark Red 94 is without doubt an exceptional racquet, slightly better than the X-Black, for the comfort it provides for hard hitters like me. The X Red 99 is a curious animal as it takes some time to realize it's amazing potential. Not powerful, but control oriented and absolutely lethal at the net. The Pro One 97 has even surpassed the X-red and initial black Formulas. I have added lead at the throat and have strung it at 25 kgs. It is now even more comfortable more powerful and tremendously precise. In fact you get to notice these fine details once your game has become more competitive and more demanding. I made the mistake of stringing the Pro One GT with the new Wilson natural gut last week at 25.5 kgs (56 pounds), above the recommended tension. The racquet seemed very stiff, had lost power, and I thought my arm would feel the consequences of such a messy string job but even then the comfort remained unfailing. This was not the case with the Babolat Pure Strike Tour which when I strung it at 25 kgs with natural gut it gave me a slight pain in my wrist and arm after an hour or so. Ah, the loyalty to Donnay! Alfie Liebmann knows the importance of maximum racquet power for seniors like himself with short compact swings. The 76-year-old Aventura, Fla., has been playing with the Wilson Hyper Hammer for years, a frame that became known as the “Viagra” of tennis racquets when it debuted in 1998 and remains a popular and legendary power monger. (http://www.nytimes.com/1998/09/27/style/pulse-lightweight-tennis.html). “The Hyper Sledge Hammer promises to blast past titanium models and become the power racquet for weekend hackers,” wrote The New York Times, noting it wasn’t made for top pros who supply their own power, but for weekend hackers and seniors who want more zip on their shots. That was enough for power-hungry Alfie who has been a Hammer devotee ever since. That is until he demoed the Donnay Super Lite 114 recently. His verdict: “More power than my trusty ol’ Hammer,” he said about the potent pop of the 114. He not only felt the power, but he also felt the love. He bought not one, but two Donnay SuperLites. Now that’s the kind of doubling-down we like to hear! We get calls and emails everyday from Donnay Xenecore users who tell us how our shock-absorbing solid-core frames have helped them overcome wrist, arm, elbow and shoulder injuries, but none have impressed us more than San Antonio’s Sal Casillio, 60, an 80-time national and international singles and doubles champion in every age division who has been injury-free since he switched to the Formula Tri Core last April. 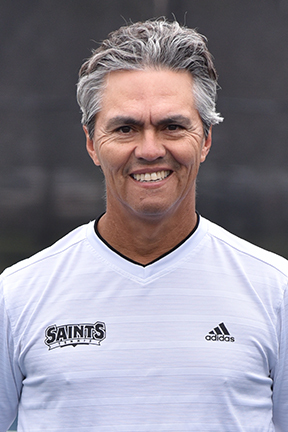 In fact, Sal who also coaches the Our Lady of the Lakes men’s college team in San Antonio, began noticing shoulder pain in 2008 and eventually he says it got a whole lot worse. By 2010, his injuries had reduced his serve 15 miles per hour and had taken the bite out of his lethal signature heavy-slice backhand. “It was too painful and I hate taking anti-inflammatories,” he says. But he played through the pain with various hollow-core racquets, and that only made it worse. In January, Sal’s quest for a more arm-friendly racquet led him to demoing the solid-core Formula after he read some positive reviews. “I’m playing pain-free now — my chronic bad shoulder doesn’t bother me at all now. 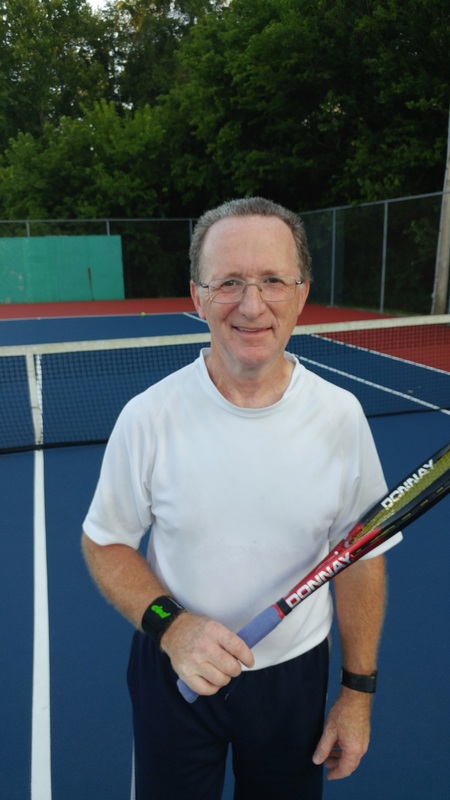 He reports his arm problems are gone and he entered the national grass court championships in the 60s single division earlier this month where he lost in the quarterfinals to the eventual winner of the tournament. “The best part was the match had the quality of tennis I used to play. We’ll keep you posted on the progress of a great competitor who Sports Illustrated once cited for being the only player to ever win four national USTA doubles titles with four different partners on four different surfaces in the same year. Use our updated tennis racquet selector tool to find the Donnay tennis racquet that fits your playing style and requirements..